"We were just down to earth, working class lads at the end of the day and we still are." KNAC.COM: Hello Ian, how are you sir? HILL: I’m fine thanks, and yourself? KNAC.COM: I’m doing pretty well – when I started doing all this writing several years ago I never imagined I’d have the honor of talking to you so this is a great moment for me. KNAC.COM: So how’s the touring going? HILL: It’s going really well, thanks; it’s going really, really well. We’re really happy with the attendance we’ve been getting, it’s quite an achievement in this day and age really to fill these types of venues. 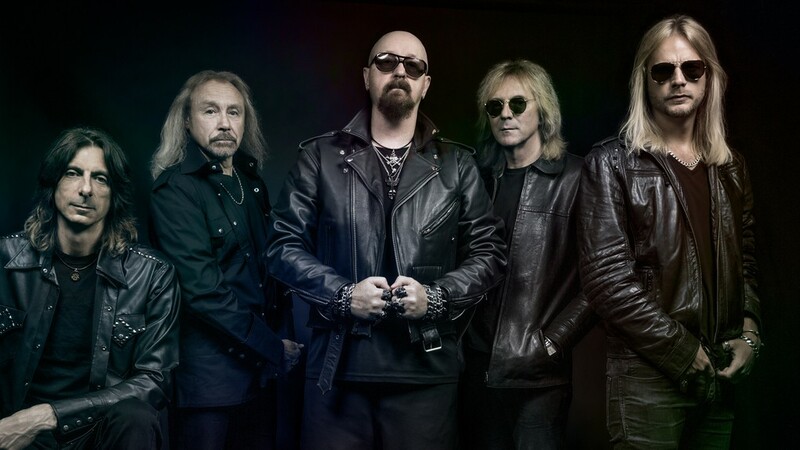 KNAC.COM: I was actually thinking about that – you guys are the iconic old Rockers that don’t quit, you just keep coming back; but whereas some of the other legends like ZZ TOP are relegated to a lot smaller venues now, people still come out in droves to hear JUDAS PRIEST. HILL: Well we are a bit as well to be honest, we’re not filling big domes like we used to in any case; nobody is really these days. There’s so much competition for people’s leisure time these days it’s unbelievable so it’s not surprising really. It is quite the testament though that there’s a live act situation and people are still wanting that, and like I said we’re doing this about as well as anybody really. It’s great that after 50 years we’re still pulling people in and we’re still relevant enough, you know it’s a great feeling really. KNAC.COM: Yeah that’s great. 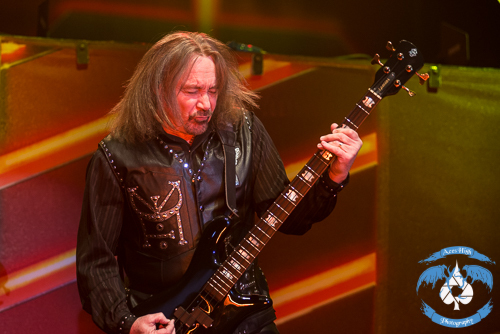 And I was wondering – you started JUDAS PRIEST in 1970 with K. K. [Downing], did you fathom even a fraction of what JUDAS PRIEST was going to be for you in your life, such a major piece for such a long time? KNAC.COM: You’re kind of a new breed in that sense. KNAC.COM: I was reading that pretty early on you were dating Rob Halford’s sister and then were married for several years. In the Rock & Roll world it seems like a lot of rifts that are caused involve a woman; did the fact that she was Rob’s sister ever cause any friction? HILL: Not really, no; I mean for Sue and I it was really for the best that we split at the end of the day. I mean in those days - you’re talking the 80’s here, or the early 80’s – and it was “album, tour, album, tour, album, tour” every year and it gets old after a few months. I mean of course it was necessary and everyone was getting their living out of it, but I do regret missing my boy growing up – or at least the first part of his life – I missed most of that you know, and I do regret that. But it was a necessary thing, we travel for a living and it’s true for anyone who travels for a living – it doesn’t matter if you’re a truck driver or actor or whatever – everybody goes through a similar sort of thing. KNAC.COM: That’s kind of the penance for the honor to be in a successful band like that, there’s definitely a down side in that especially when it comes to your family. HILL: Yeah but it’s been immensely enjoyable, all of it really, even the nights of sleeping in a van was sort of enjoyable if you know what I mean; but there are regrets along the way. KNAC.COM: Sure. 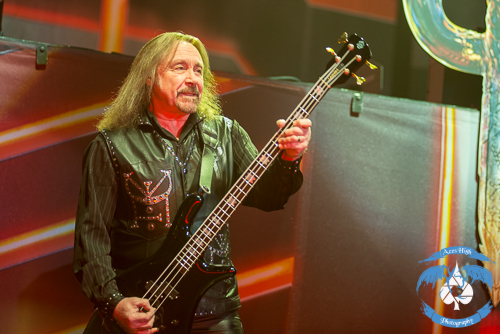 So I was wondering if you could tell us as far as Glenn [Tipton]’s health – I know he was able to help write and record the album but will he be able to tour and write anymore or could Firepower be his swan song? HILL: He’s doing that as we speak! (laughs) You know Glenn’s trouble is - Parkinson’s is a horrible disease and unfortunately unless some kind of cure comes along he won’t be able to go on tour anymore; he’s going to come out when he can, there were a couple of shows he came out to where he came onstage during the encores and it was great. We just can’t promise, you know we can’t have people buying tickets counting on that. He’ll get onstage when he can, there’s medication that helps with his strength and to take care of the shaking that happens with Parkinson’s, but there’s just no way he could get onstage and do a full show. It was a tough moment when we were in band rehearsal and he had to admit to himself that his body wasn’t going to let him do what he wanted it to do, what he loved to do more than anything else. It was quite a sad moment. But he’s a fighter, he’s nothing if not a fighter, and he’ll be there whenever he feels that he can, but as to when I can’t say. KNAC.COM: That’s fantastic. And I really feel a heavy presence of Glenn’s style on the new Firepower album; I think this is some fantastic material it takes me back to the Screaming For Vengeance days. It’s awe-inspiring to see a band 50 years into their career that is still able to come out with such a solid slab of material. KNAC.COM: I can see that, honestly; it has the classic feel to it and I’ve been really impressed, I’ve been listening to it on repeat in my car. (laughs) Was there anything different, is there anything you can attribute as to why this album came out the way it did? HILL: No, we approached this music the exact same way we approach any album, we didn’t do anything different in the writing and production but we had two producers and I think that always makes a difference. You know sometimes you’ll get tunnel vision, you get the blinkers on and you see to the end of the tunnel but you don’t see what’s going on to either side. It’s good to have somebody who can also stand back and see the whole thing and know when to make changes here or there. They really did just a tremendous job on the production and I think the sound on the album is really all attributable to them. KNAC.COM: The album was #1 in Sweden & Czechoslovakia and Europe has always been absolutely maniacal when it comes to JUDAS PRIEST. Can you name one or more of your favorite places that really stand out for you and every time you go on tour you look forward to returning to a specific spot? HILL: Not really, we’re really fortunate to have…you know our fans are just as mad as the other, just like you are, we just get great responses from all over the place. I do love coming here to the States, I really do – we’ve been coming here for a long time and all of America has a big place in our hearts, we love coming over here. There are other places too that are beautiful – and places that are not so beautiful – but at the end of the day going up on stage and those wonderful fans are there…every day I wake up and feel honored and humbled really still being able to do it after all these years, you know? It’s been a great way to earn a living. KNAC.COM: And to have been around as long as you guys have – I mean the band itself is eight years older than me – so to have all these fans that have been there since the beginning and for them to have this great soundtrack of your music throughout their lives and they’ve had the constancy of being able to follow you on this path, I think there’s this intimate connection between you and the fans, it’s a long time connection. HILL: Yeah that’s right, I mean sometimes you see people that are not just with their kids but with their grandkids, you know? It’s great, I don’t know what we do why we’ve lasted so long. I think basically we try to stay current and we try to move forward with every project we have, we always take that step forward and we try to learn things every day and I think that’s kept us going for all these years. KNAC.COM: And you seem to have stayed humble, which keeps your expectations where they should be. HILL: Yeah I mean we were just down to earth, working class lads at the end of the day and we still are.